If you're looking for a great (and cheap!) hotel in Cabo San Lucas, CheapTickets is the best place to find them. We offer deals on the best 259 hotels throughout Cabo San Lucas. No matter what you're looking for, we have options for you. Grab great rates on the 92 affordable 3-star hotels that are easy on the wallet without sacrificing comfort. Looking for more luxury? Try one of the 91, 4-star hotel accommodations in Cabo San Lucas. No matter your budget needs, we've pulled out all the stops to make sure you have plenty of vacation options. Maybe you prefer to search for your hotel deals based on what each hotel offers? For example, let's say you just want to find a hotel or resort that has a pool to cool off in after a long day exploring Cabo San Lucas. Scroll down to choose from the 70 hotels in Cabo San Lucas that has a pool for guests. Or search for deals on Cabo San Lucas hotels offering free wifi or breakfast, non-smoking rooms, and more! CheapTickets is here to be your personal travel agent for your next trip to Cabo San Lucas. Get booking today! What hotels in Cabo San Lucas offer free wifi access? Are there deals on Cabo San Lucas hotels offering free breakfast? Yes! The only thing better than finding a great deal on a cheap hotel in Cabo San Lucas is finding one that offers free breakfast. Grab some eggs, a waffle, or some healthy oatmeal before a day full of exploring Cabo San Lucas and all that it has to offer. Below are just some of the many hotels that offer free breakfast in Cabo San Lucas. Grand Fiesta Americana Los Cabos All Inclusive Golf & Spa is a 4.50 star rated hotel property in Cabo San Lucas that offers free breakfast. 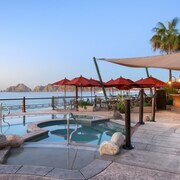 Villa La Estancia Beach Resort & Spa is a 4.50 star rated hotel property in Cabo San Lucas that offers free breakfast. 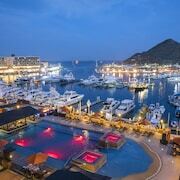 ME Cabo is a 4.00 star rated hotel property in Cabo San Lucas that offers free breakfast. Cabo Pedregal Hotel is a 2.50 star rated hotel property in Cabo San Lucas that offers free breakfast. What about deals on pet-friendly hotels in Cabo San Lucas? Cabo San Lucas is a great place to get outside and explore with your pets in tow so don't leave your furry friends behind. Below you'll find great deals on hotels in Cabo San Lucas that allow pets. Don't forget to bring plenty of treats! Casa Dorada Los Cabos Resort & Spa is a popular, pet-friendly, 4.50 star hotel in Cabo San Lucas. 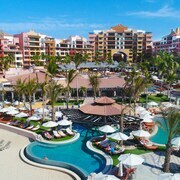 Pueblo Bonito Pacifica Resort & Spa-All Inclusive-Adult Only is a popular, pet-friendly, 4.50 star hotel in Cabo San Lucas. Tesoro Los Cabos is a popular, pet-friendly, 3.00 star hotel in Cabo San Lucas. Villa del Palmar Beach Resort & Spa Cabo San Lucas is a popular, pet-friendly, 3.50 star hotel in Cabo San Lucas. Any good rates on Cabo San Lucas hotels with restaurants? Absolutely. Don't want to deal with planning our all your meals on your trip to Cabo San Lucas? We don't blame you. Keep the hangry away by staying in one of the 53 hotels that have restaurants. With a room at one of these spots, all it takes to get a good meal is hopping in the elevator. Check out some of the most popular hotels in Cabo San Lucas that have restaurants below. Book Pueblo Bonito Los Cabos Blanco - All InclusivePueblo Bonito Los Cabos Blanco - All Inclusive is a 4.00 star hotel and has one or more restaurant options. 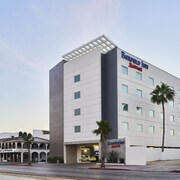 Book Welk Resorts Sirena del MarWelk Resorts Sirena del Mar is a 4.00 star hotel and has one or more restaurant options. Book Hacienda del MarHacienda del Mar is a 4.50 star hotel and has one or more restaurant options. Book Pueblo Bonito Rose Resort and Spa - All InclusivePueblo Bonito Rose Resort and Spa - All Inclusive is a 4.00 star hotel and has one or more restaurant options. What are the cheapest hotels in Cabo San Lucas with pools? What's better after a long day exploring Cabo San Lucas then a relaxing dip in a pool? Finding the Cabo San Lucas hotel you need for a bargain! Cool off and unwind at one of our 70 Cabo San Lucas hotels with a pool. Browse some of the top deals on these hotels and resorts with pools in Cabo San Lucas below, but be warned: You may not want to check out! 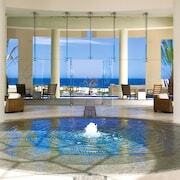 Sheraton Grand Los Cabos Hacienda Del Mar has a pool and a 4.50 star rating. Bahia Hotel & Beach House has a pool and a 3.50 star rating. 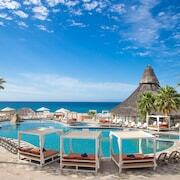 Cabo Villas Beach Resort & Spa has a pool and a 4.00 star rating. San Angel Suites has a pool and a 3.00 star rating. What hotels in Cabo San Lucas offer parking for guests? Once you've made your way to Cabo San Lucas, the last thing you want to deal with is finding parking close to your hotel. Avoid the hassle of parking around the block and carrying your luggage all the way to the lobby by booking one of our hotels with parking. Check out deals on some of the 77 hotels in Cabo San Lucas that offer parking for guests. 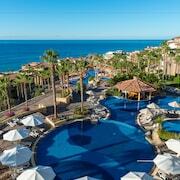 Pueblo Bonito Montecristo Luxury Villas - All Inclusive This hotel has a 4.50-star rating. Villa del Arco Beach Resort & Spa This hotel has a 4.00-star rating. Sunrock Condo Hotel This hotel has a 3.00-star rating. Plaza Nautica Condominiums This hotel has a 3.00-star rating. Do Cabo San Lucas hotels offer 24-hour concierge services? When you're on vacation, things don't always go according to plan. Travel with peace of mind when you book one of our 116 hotels in Cabo San Lucas with 24-hour concierge service. That way you know help is always phone call or elevator ride away. Try HOTEL BAJA CABO. It's a 2.50 star rated hotel in Cabo San Lucas that offers concierge services 24 hours a day. Try Hotel Mar de Cortez. It's a 3.00 star rated hotel in Cabo San Lucas that offers concierge services 24 hours a day. Try Playa Grande Resort & Grand Spa. It's a 4.00 star rated hotel in Cabo San Lucas that offers concierge services 24 hours a day. Try Marina Fiesta Resort & Spa. It's a 4.00 star rated hotel in Cabo San Lucas that offers concierge services 24 hours a day. What about low rates on non-smoking hotels in Cabo San Lucas? 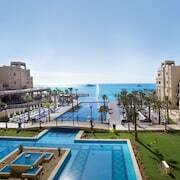 Riu Santa Fe All Inclusive This hotel has a 3.50-star rating. Maria Elena Hotel This hotel has a 2.50-star rating. Welk Resorts Sirena del Mar This hotel has a 4.00-star rating. 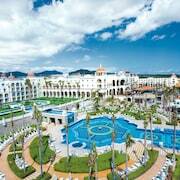 Riu Palace Cabo San Lucas All Inclusive This hotel has a 4.00-star rating. What are the cheapest Cabo San Lucas 3-star hotel deals? Our 3-star hotels bring you quality accommodations at a lower price point for the perfect, budget-friendly vacation in Cabo San Lucas. With 92 3-star hotels throughout Cabo San Lucas to choose from, you still have options. Browse our selection below. Riu Santa Fe All Inclusive. Resort is located along the renowned Medano Beach with spectacular views of the Arch at Land’s End. Downtown Cabo San Lucas, shopping, restaurant and nightclubs district is within 4 km (2.5 mi). Solmar Resort. Nestled on the beach, this Marina hotel is within a 5-minute walk of Land's End, The Arch, and Lover's Beach. Solmar Beach and Cabo Dolphins are also within 10 minutes. Villa del Palmar Beach Resort & Spa Cabo San Lucas. Located 1 mile from downtown Cabo's shopping and nightlife, this fun, family-friendly resort along Medano Beach offers incredible views of the Arch and Land’s End. Tesoro Los Cabos. Adjacent to the sportfishing center of Cabo San Lucas Marina and close to dining and nightlife, this striking adobe-style hotel includes a ground-floor shopping mall. What are the best deals on 4-Star Hotels in Cabo San Lucas? Cabo San Lucas is full of hotels and it can be hard to narrow down where you really want to stay. Luckily, we've done that hard work for you be narrowing you from 259 hotels throughout Cabo San Lucas, to the 91 4-star hotels in Cabo San Lucas. Our 4-star hotels in Cabo San Lucas are exactly what you need for your next family trip, romantic weekend, or solo getaway. Check out our most popular deals below. Riu Palace Cabo San Lucas All Inclusive: Less than 3 miles from Cabo San Lucas downtown and marine, this 642-room resort faces Médano Beach with views of the Arch and Lover’s Beach. Exceptional service and courteous staff. Pueblo Bonito Sunset Beach Resort & Spa - All Inclusive: Secluded on the Pacific Ocean side of Baja California's tip, this beachfront all inclusive resort is terraced into a landscaped hillside providing panoramic views of the ocean and picturesque shore. Grand Fiesta Americana Los Cabos All Inclusive Golf & Spa: Located in the touristic corridor linking San Lucas and San Jose, this ocean front resort features an innovative spa and 36-holes of championship golf. Pueblo Bonito Rose Resort and Spa - All Inclusive: Located on calm-water Médano Beach and facing Los Cabos's signature Land's End rock formations, this all-suites resort is 6 blocks from downtown Cabo San Lucas' shopping, dining, and nightlife. What are the most popular attractions in Cabo San Lucas? People travel to Cabo San Lucas from all around to witness the incredible sights and attractions. With 17 sights to see during your stay, you're sure to have a busy trip in Cabo San Lucas. Below, we've listed some of our favorites. The staff is friendly the entire property is clean and very well maintained. I love this resort. We really appreciated the studio apartment type room that allowed us to have separate areas for cooking, dining and sleeping. The view was good; however, we thought it would be a full view of the ocean - not an angled view. The assistance with renting a car was great. Also shuttle assistance to and from airport was a big help. We also appreciated the snorkeling equipment free to use on or off the property. Staff very helpful and friendly. Breakfast was good. Located walking distance to restaurants and beach.